Get ready for an a-maze-ing mission around the world! Brilliant but absent-minded photographer Geronimo Keats is back from the trip of a lifetime. The only problem is, his luggage…isn’t! Time for young explorer Marco to swing into action and find his missing belongings – but he’ll need your help! Travel the world like never before in this brilliant book of mazes brought to you by Lonely Planet Kids, an imprint of Lonely Planet, the world’s leading travel guide publisher. In Lonely Planet Kids Marco’s Maze Mission, you’ll tackle fiendish mazes and discover incredible facts on every page as you explore Norway’s fjords, the USA’s Grand Canyon, New Zealand, Belize and beyond. 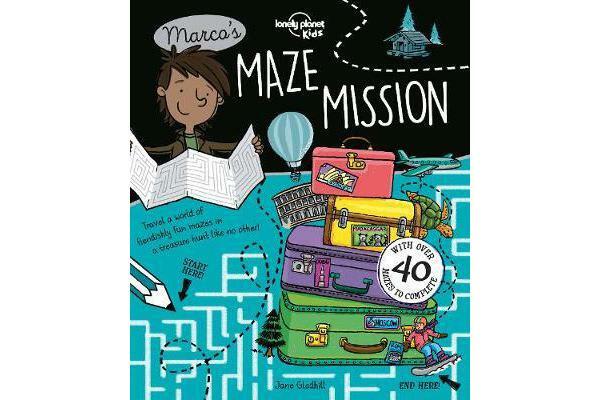 Packed with fun illustrations and a gorgeous two-colour palette, Marco’s Maze Mission provides hours of brain-boggling fun for children aged 7+. About Lonely Planet Kids: Come explore! Let’s start an adventure. Lonely Planet Kids excites and educates children about the amazing world around them. Combining astonishing facts, quirky humour and eye-catching imagery, we ignite their curiosity and encourage them to discover more about our planet. Every book draws on our huge team of global experts to help share our continual fascination with what makes the world such a diverse and magnificent place – inspiring children at home and in school.